For indoor or outdoor use. Tough plastic base holds water reservoir for fresh water on demand. Easy to refill with top snap off lid. Easy to clean, durable plastic with clear food chamber so that you can monitor the water level. Supplies pet with fresh water while owners are away. Tough plastic base holds water reservoir for fresh water on demand. Easy to refill with top snap off lid. Easy to clean, durable plastic with clear food chamber so that you can monitor the water level. Supplies pet with fresh water while owners are away. For indoor or outdoor use. 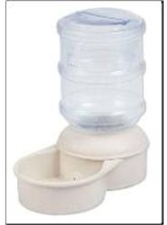 Tough plastic base holds water reservoir for fresh water on demand.